Growing up, I knew few real-life heroes. Therefore, I wanted the books I read to have heroes, and I wanted escape and redemptive endings, as well. Agatha Christie’s mesmerizing stories and blazing honesty about human nature would have fascinated me but, ultimately, I wanted to be comforted and given hope that people can change for the better. Not so my friend from high school, Doug, whose take on reading was braver and more mature. I admire it. We didn’t discuss books back then, but now I wish we had. My reading life would have been all the richer. I didn’t know what Doug was reading, but I did know he could take command of a stage like no one I’d ever met. I always thought there was something rock-solid real about Doug, and that carried through in the roles he played in our high school productions. Whatever “character” he portrayed came so naturally to him, with such depth and nuance, the rest of the actors seemed mere shadows. That sprang from Doug’s talent and hard work, of course, but I can’t help but think that, as a discerning reader, he started off with a close and perceptive reading of the script. 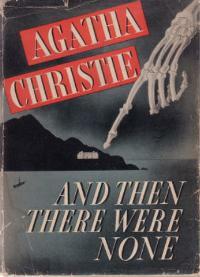 Recently, I discovered that the thriller I loved as a child, Agatha Christie’s And Then There Were None, is in sixth place among the best-selling novels of all time. Ten people, mostly strangers to each other, are mysteriously invited to an isolated island. On the island, a disguised, recorded voice accuses each of having gotten away with a murder. One by one, in circumstances resembling the children’s rhyme, “Ten Little Indians,” they are punished for their crimes. If you read the original 1940 novel after seeing the stage version (“Ten Little Indians”) or a subsequent film adaptation, you may be jarred by the absence of anything like a redemptive ending. On stage and film, two romantically linked characters (Vera and Lombard) among the ten doomed to destruction manage to outwit their persecutor. Coincidentally, these two are revealed as innocent of the murders for which they were condemned. Christie’s novel offers no such hogwash; the wolfish hero and the fast-shooting heroine are both guilty as sin, and they pay dearly for it. Thoroughly bored by “children’s literature” as a 10-year-old, I savored Christie’s descriptions and plotting. Three matters fascinated me: the structure of effective stories, the accountability of adults who are hypocrites, and the assurance that justice will somehow be done. As to structure, Christie is marvelous. The book wastes little space on peripheral matters: the characters are introduced, the problem presented, and each succeeding crisis fluidly developed. On the accountability side, I was thrilled as a child that each adult was truly guilty behind all the posturing. Agatha Christie wrote a story without heroes; to me, that was heroic honesty. I knew enough about school teachers who practiced petty cruelty, clerics who were status-driven, and older family role models who considered the law something to break when getting caught was unlikely. I had a child’s faith in the abstractions of good and evil described in the Bible, but I was sharply aware that no one was completely one or the other. Conversely, the inevitability of justice satisfied me. For all my contempt for two-faced authority, I still relished the idea of wrongdoers punished by divine oversight. My sense of my own weakness as a child needed that reassurance. (When Vera discovers a waiting noose, I was convinced supernatural justice was at hand, a conclusion with which the character herself concurs.) To me, Christie’s revealing the true killer in a post script seemed logically necessary, but somehow anticlimactic. Today, I reread Christie mysteries and still admire her superb craftsmanship, though I wince at the stilted dialogue and wooden characters. But it was Agatha Christie who showed me when I was a child just how enthralling a well-plotted book can be. Without And Then There Were None, there might not have been copies of Crime and Punishment or The Sea, The Sea sitting on my bookshelf. Doug Hoehn’s to-read list isn’t too ambitious, just all the great works of philosophy and the most critically recognized novels of every nation on earth, while he rereads mysteries, westerns and science fiction – as he says, the snack between meals. I hope to entice Doug back some time for a guest post on his international reading. Doug has starred in countless amateur theater productions, including the title role in “Macbeth,” the role of Bottom in “A Midsummer Night’s Dream,” and a one-man show of readings by Edgar Allen Poe. His favorite playwrights are Shakespeare, Eugene O’Neill, and Tennessee Williams. Doug is a job coach for Toward Maximum Independence, an agency that supports people with developmental disabilities in the workplace. He lives in El Cajon, California with his life partner. Visit the official Agatha Christie information and community website. Quotes from And Then There Were None, Agatha Christie, HarperCollins Publishers, New York, 2011.